Peel, devein, and butterfly the shrimp, leaving the tails on if you like. Place shrimp in a mixing bowl and toss gently with olive oil, wine, 2 tsp salt, and 1 tsp pepper. Set aside. In a small bowl, mash the butter and garlic, shallots, parsley, rosemary, red pepper flakes, lemon zest, lemon juice, egg yolk, panko, 1/2 tsp salt, and 1/4 tsp pepper until well mixed. 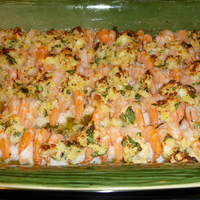 In a shallow, oven proof serving dish, arrange the shrimp in a single layer butterflied side own with tails curling up and toward the center of the dish. Pour the remaining marinade over shrimp. 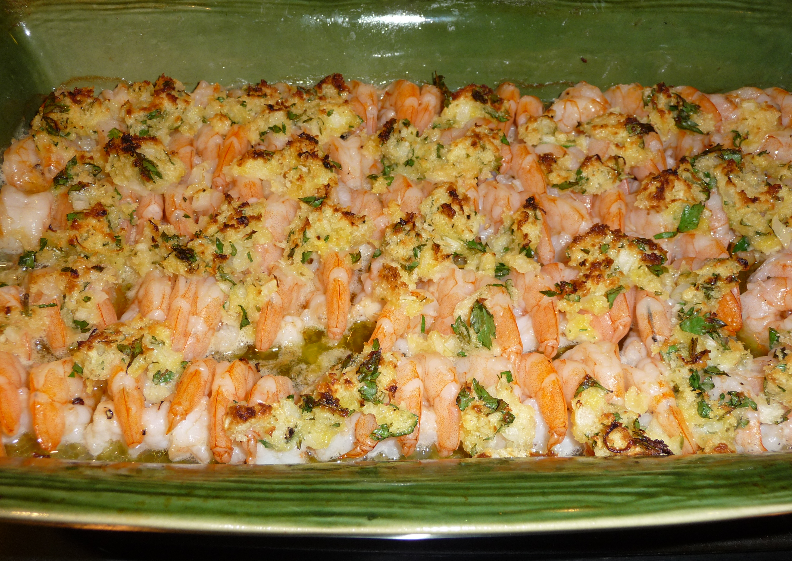 Spread the butter mixture evenly over the shrimp. It's a little tricky to spread it evenly, just do your best as it will melt and disperse when baked. Bake for 5-6 minutes on high until hot and bubbly. If you want to brown the top of the bread crumbs, place under a broiler for 1 minute.